Yuki Hana celebrates Japanese cuisine with a unique fusion approach and a menu that focuses on exotic ingredients and sophisticated presentations in the Oviedo area of Orlando, Florida. We wish to create an extraordinary culinary experience that out guests will never forget, and to inspire and educate our guests on Japanese Fusion sushi and cuisine at its finest. We begin by applying traditional Japanese cooking methods and ingredients, then blend them with techniques and ingredients from other cultures such as braised oxtail, Italian inspired sauces and locally sourced produce as well as a vast variety of ingredients from all over Asia. The results are flavor combinations that are quite unique and even sometimes playful. From small plates to sushi specialties, our chef showcases the freshest fish from the worlds finest markets and producers such as the famous Tsukiji fish market in Tokyo, Hawaii, hokkaido and local sources. 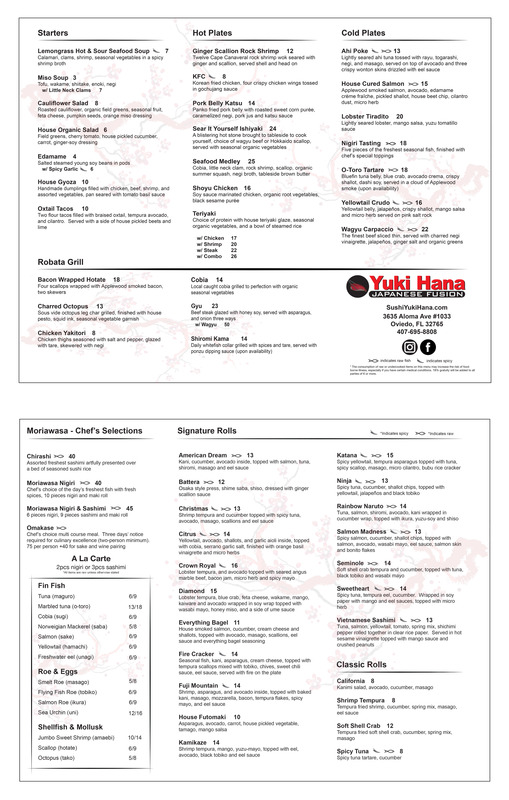 At Yuki Hana, we strive to tantalize your taste buds, provide you with friendly, attentive service and remain consistent with the quality of our product, through and through. Our service team is devoted to excellence. Every team member has a genuine passion for hospitality. We are thrilled to be a part of something different. We get to be around fun and exotic ingredients everyday! Therefore, we are always trying new things, learning new techniques that are being executed in the kitchen and behind the sushi bar. We aspire to be knowledgeable, friendly and professional, as well as to inspire our guests and educate them on our “out of the ordinary” menu selections. We truly love being in the business of hospitality, we stand by our cuisine and we are so excited about what we get to do everyday. If we can share that passion and it shows through to our guests, then we have achieved our goal. So please, sit back and relax. Let us take care of the rest. Enjoy!